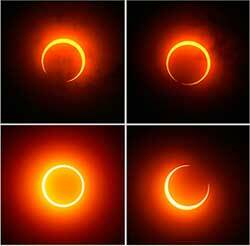 The first Solar Eclipse of 2013, will take place on the 9th and 10th of May, 2013. According to Western Astrology, the Solar Eclipse will be on 10th May, owing to the fact that a day is counted from 12 o'clock at night. The Eclipse will start taking it's form at 2:55 am till 8:55 am. But, Indian Astrology's calculations begin from the rising of the Sun. Hence, as per Indian Astrology, Solar Eclipse will start on the 9th of May and end on the 10th May. This Solar Eclipse will not have any major impact on India because when the Moon traverses between the Earth and the Sun, India will be experiencing night time. Normally, a solar eclipse occurs during the day, in such a case, its impact would be forceful. This Eclipse will take place on the fourth quarter of Aries and Bharani constellation. During the period of Solar Eclipse, Mercury and Mars will be in an extreme as well as fixated position, which will impart negativity. Sun, Moon, Mars, Mercury and Ketu are making "Panchagrahi Yoga" in Aries at that time. Retrograde Saturn will be aspecting this eclipse.This Solar Eclipse is not going to be very favourable for the Government. It could have an adverse impact on the coming General Elections that are going to be conducted around six months from now, in 2014. The Government has a chance of losing its present position. The agricultural sector may also suffer. The Southern end of Malaysia, Southern part of the Island of Sumatra, East Philippines, Indonesia, Northern area of the Indian ocean that is close to Australia, and Pacific ocean will experience this Annular Solar Eclipse. The Eclipse will commence on 9th May, on Thursday at 2:55 am. Since India will not be able to see this Eclipse, it will not even take its 'Sutak'. Now, let us see the impact it will have on all the zodiac signs. Aries- You may have a reason to be concerned about your work. You may get into a conflict with your partner but there is hope for some auspicious news. Taurus- You may enjoy financial gains. Avoid getting into conflict with your in- laws or enemies. Drive very cautiously. Gemini- You may be overloaded with work. You may also face tension in your married life. You will get several employment opportunities, but don't invest your time on useless work. Cancer- You will be concerned about your responsibilities toward your parents. Be careful while managing your finances. Leo- You will be surrounded with family conflicts. Expenditure is bound to rise in your home. You will be worried about your child. Have control over your words. Virgo- You may face problems in starting new projects but at the end of the day your hard work will pay off well. You may face problems in maintaining unity in your relations. Do not mis-utilise your time. Libra- Don't get involved in irrelevant arguments. Stay away from your enemies. You will get the finances you'd been expecting. Scorpio- You will receive cooperation from your family members. Due to lack of time, some of your work will be left undone. You may suffer from mental conflicts. Sagittarius- You will be successful in all your planned work. You may be in a conflict with your partner. Watch over your words and sentiments. Capricorn- You may have some fun and frolic with your friends. This is an appropriate time for love. Increase in electricity consumption will add to your expenditure. Avoid taking loan. Aquarius- Increase in expenditure. Your health will be in perfect shape. You may plan on something big. You may have an inclination toward philanthropy. Pisces- Good advices from your well wishers will benefit you. You may have to make a travel. You may develop an interest in charity. Prevent a situation of indecisiveness.